Getting a chip or a crack in your RV windshield can put a screeching halt on a road trip near or far. A imperfection such as this can not only be an eyesore, but it can also be a safety issue if not addressed quickly. 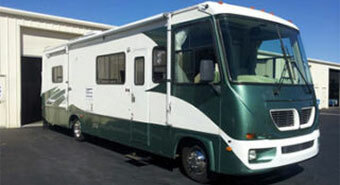 Although more complicated because of the size of the vehicles, chips and small cracks can be effectively repaired on a RV. Ignoring a small chip or crack on an RV is never a good idea. If the vehicle continues to be driven, especially long distances on the freeway, this small flaw can quickly spread across your windshield due to temperature changes, pressure on the windshield from weather, pot holes or bumps on the road and other circumstances. All of our technicians at Auto Glass Warehouse are highly trained in RV windshield repair and will provide a quality repair to every RV they service. 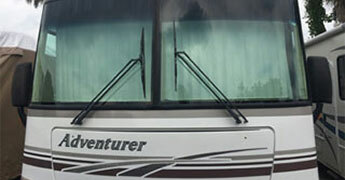 All RV windshield repairs done through Auto Glass Warehouse can be done as a insurance claim or a out-of-pocket payment. We are approved by all insurance companies to do any and all windshield repairs. If you should call your insurance company first, always make sure to ask for the Auto Glass Warehouse to service your RV windshield repair. As with all of our repairs and replacements, we offer mobile service to your home or work for all RV windshield repairs. We will always make sure to provide you with a quality windshield repair. However, not all stone chip repairs will be invisible after they are repaired. It is possible to see a slight blemish where the repair was due to the windshield coming in contact with contaminates such as gas, dirt or oil residue or products such as rain x. Since the resin used in the repair sets quickly, it is not possible to re-do that specific repair. Thus, it is very important to do your windshield repair quickly after the damage occurred so as to not have the area exposed to these elements for long amounts of time. The less contaminates that collect on the damaged area, the less noticeable the repair may be. If you need a RV windshield repair, trust it to the Auto Glass Warehouse. Call us today to set up an appointment.